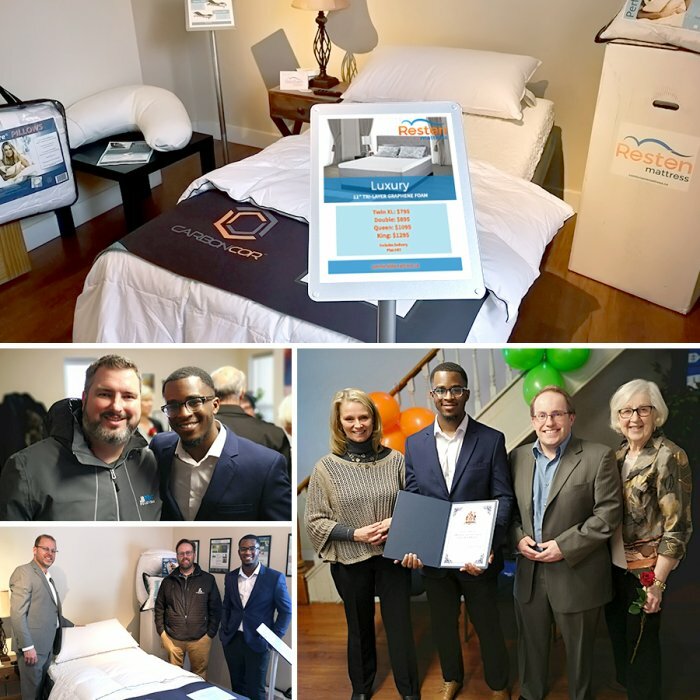 Local Small Businesses came together and celebrated the new partnership with national mattress company Resten, who is becoming a strong force in the market, competing directly with well-known brands like Casper & Endy. Their website can be visited here: comfortablemattress.ca . OSM Websites and Resten started their partnership late last year providing branding, web development and digital marketing solutions and now have added local small businesses JB Print Solutions & Prime Focus Productions to the roster for ongoing print and videography solutions. Together these small businesses have modeled what makes doing business in the Quinte Region so remarkable. Working together to make Quinte a better place to start and grow small business! On February the 14th (Valentines Day) OSM Websites had a special gathering, celebrating the partnership with Resten Mattress. Special guests included Councillor Pat Culhane from the City Of Belleville, The Belleville Chamber Of Commerce President Jill Raycroft, President of JB Print Solutions Ian Anderson and President of Mackay Insurance Bruce Mackay. New owner and president of OSM Websites Joshua Edwards hosted the event at his main office, located at 81 Dundas St East in Belleville and expressed excitement at the event about the partnership and his new journey as a young entrepreneur at the age of 25. Joshua wants to encourage young entrepreneurs in the Quinte Region with the opportunities to do business with major players in the Greater Toronto Area. President of Resten, Kevin Saunders also expressed his excitement about the partnership and benefits of dealing with a local branding, design and digital marketing firm. OSM Websites encourages the local support of Resten who has ties to the Belleville community with Kevin Saunders (President Of Resten) being the son of Bill Saunders (Former President Of The Belleville Chamber Of Commerce). Joshua Edwards expects to continue growth in the Greater Toronto Market and is looking for opportunities to partner with local, young entrepreneurs. Thinking about starting an ecommerce website? What Is Responsive Design? Why Make Your Website Responsive? Content Marketing "Give & You Will Receive"